It was another week that ended with a couple of stories filed but not yet posted (look for a long item on the Disruptive Competition Project in the next day or two about the state of competition in browser layout engines). But it’s not every week that sees me finishing it on the other side of the Atlantic–I’m spending the next four days in Barcelona to cover the Mobile World Congress show. 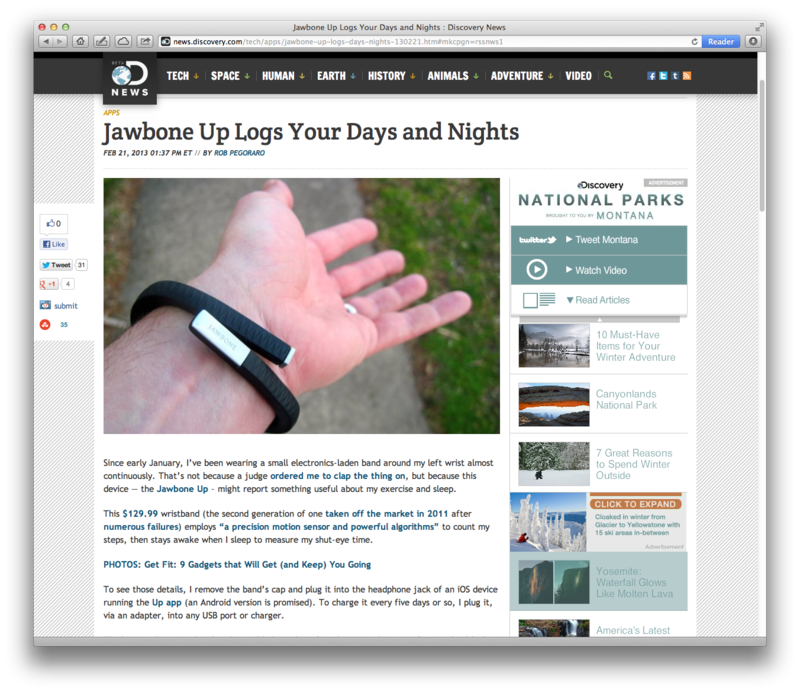 I took an unusually long time to try this activity-monitoring wristband–starting after CES. That leisurely pace allowed me to note the recent arrival of a similar background exercise-tracking option in Android’s Google Now app. Something like that won’t replace this wristband’s scrutiny of your sleep, but it could prove good enough for reporting whether you get off your duff often enough. There are some other devices like this coming out over the next few months–the Fitbit Flex and Withings’ Smart Activity Tracker come to mind–so hopefully I can do a follow-up review of them. My annoyance at having two Google Voice calls via Gmail leave the other person sitting there in puzzled silence led to this cheat-sheet guide to dialing out from your GV number. The column concludes with a tip based on a reader’s query on my Facebook page–yes, I really do read the comments there. This entry was posted in Weekly output and tagged gmail, Google Voice, GrooVe IP, Jawbone Up, MWC, quantified self, Talkatone, voip by robpegoraro. Bookmark the permalink.